At Kaleidoscope, our motivation for innovating powerful solutions is twofold, yet inextricably intertwined: grow businesses and improve lives. 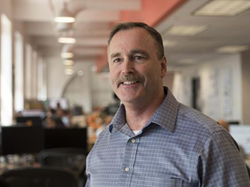 Kaleidoscope, an innovation and product design firm with global headquarters in Cincinnati hired Robert Gill as the Vice President of Engineering. Headquartered in Cincinnati, Kaleidoscope is an early innovation, product design and development firm with roughly 100 employees. With our partners, we create a better human experience - one customer, one product, one insight at a time.